Plot Summary: In the middle of class at a certain school, Rumi Yokoi, a diligent student, has her in-class life turned upside-down when her next-door desk mate "Seki" begins to play by himself at his desk in class. 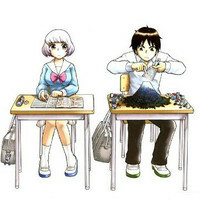 Although Yokoi is irked by Seki's distracting yet intricate playtime, she finds herself being drawn into his interesting hobby. Never being able to focus, Yokoi observes Seki's stunning ways of slacking off in class.